Peace, Jesus has left with us (John 14:27), is now obvious. If Jesus grew up with his brothers at Galilee, a bastion of Zealot, the teaching of Q source, which denies Creator God of the Old Testament and could lead people to ultimate salvation through awareness of the original Self, would not have been born. 'A fine large fish' indicates 'original Self = Supreme God (propator).' If you try to catch only big fish, you can not catch them easily. But if you round up both big and small fish with a big net and then let all the small ones escape to the sea, big ones will remain at last. If you do so, the small fish escaped will also grow and come back again. Through this way, you can always secure big fish. Though 'difficulty' must be experienced in the process of finding 'original Self,' you can find it comfortably, if you are smart like the fisherman. 'Whoever has ears to hear should hear' is Jesus' idiomatic phrase which presupposes some people can understand but others cannot understand the meaning behind the words that Jesus talks about. Although Jesus' words in Q source are cited in various scenes and interpreted differently by the authors of the Synoptic Gospels, Jesus would have been fully aware of such things. The meaning behind Jesus' words are that various people with different abilities have to find their own answer in each different environment of them. Therefore, it is natural that there are various interpretations. In that case, the knowledge of this world may interfere with understanding. The parallel article of this verse exists only in the Gospel of Matthew in the New Testament. It is as follows. The subject of this verse in the Gospel of Thomas is 'Humankind,' but it is 'the kingdom of heaven' in the Gospel of Matthew. Mr. Sasagu Arai, author of the Japanese version of The Gospel of Thomas, annotates that the contents of this story does not match for explanation of 'the kingdom of heaven' and he says, "Its main theme seems originally to have been humanism (人間論)." The Gospel of Matthew relates this parable to eschatology supplementing the following description and even explains the role of teachers of the law. 'New treasures as well as old' refer to 'the New Testament' and 'the Old Testament.' It implies that James the Less, the brother of Jesus, who led Jerusalem Church, brings out of the storeroom both of them as the owner of the house. 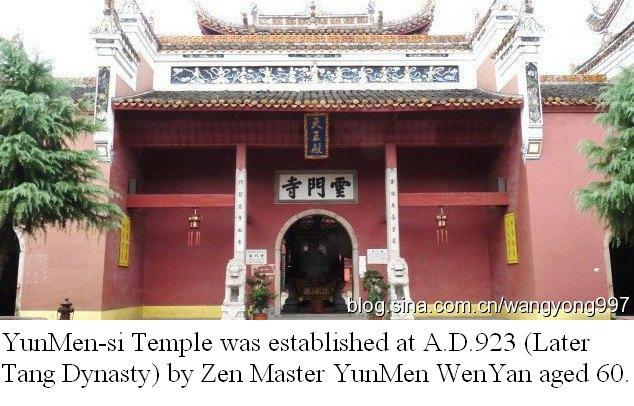 Time passed to the later period of the Tang Dynasty and the five dynasties and ten kingdoms period (907-960) in China, a monk asked YunMen (864-949), who had lived at Yunmen monastery on Mount Yunmen in Shao district of Guangdong Province and had established one of major sects of the Zen Buddhism called Yunmen School, "What are the teachings of Buddha's whole lifetime? " Buddha is said to have preached often using expedients depending on the occasion of each preach and the capacity of each people and comforted people all over India for about forty years after he had attained enlightenment under the Bodhi tree. If one tries to explain whole of his teaching, he has to make clear a huge volume of Tripitaka (Three Canons of Buddha's teaching) that consists of Sutta (Teaching) - pitaka, Abhidhamma (Treatises) - pitaka and Vinaya (Monastic rules) - pitaka. However, YunMen did not explain the whole great treasure house of Buddha's teachings through three pitakas, but just answered, "An appropriate statement (対一説Go straight)." This koan (公案: subject which Zen-masters give each religious to learn and practice the doctrine of Buddhism) has been regarded as one of the most difficult ones in the final stage of Zen practice, and it seems that various interpretations have been done since ancient times. YuanWu KeQin chanshi (圜悟克勤禅師1063-1135) who compiled 'The Blue Cliff Record (碧巌録)' comments, "Many people misunderstand the meaning of '対一説.' Some say that it must be a measure suited to the occasion. Others say that all creation is the manifest of each law and this is called '対一説.' Actually, they do not understand. Thus, Great Master YongJia (永嘉大師665-713) deplores in his Book 'ZhengDao-Ge (証道歌Song of Enlightenment),' saying 'To exert oneself to the utmost is not enough to pay off but 'an appropriate statement (対一説)' exceeds 10 billion phrases.'" From this comment by YuanWu, it is known that each koan has had various interpretations through the process of conversations or actions between Zen Master and his student in the master's room since creation of Zen Buddhism just as Jesus' words in Q source. By the way, the name Jesus is nothing other than the Greek translation of Joshua, who led the Israelites against Canaan, and means 'Jah is redemption.' And Mary, mother of Jesus, named her three sons Judas, James and Simon, These names came from the Maccabean family that had successfully thrown out the Greeks, purified and re-dedicated the Temple in the 2nd century BC. Furthermore one of Jesus' brothers was a member of Zealot. If Jesus grew up with his brothers at Galilee, a bastion of Zealot, the teaching of Q source, which could lead people to ultimate salvation through awareness of the original Self, would not have been born. Antiochus III of the Seleucid Empire, who had recaptured Palestine from the Ptolemy dynasty in Egypt, admitted the Jews limited autonomy and freedom of religion. But his son and successor Antiochus IV Epiphanes compelled the Jews to erect an altar to Zeus Olympios in the Temple and to made sacrifices of pigs. 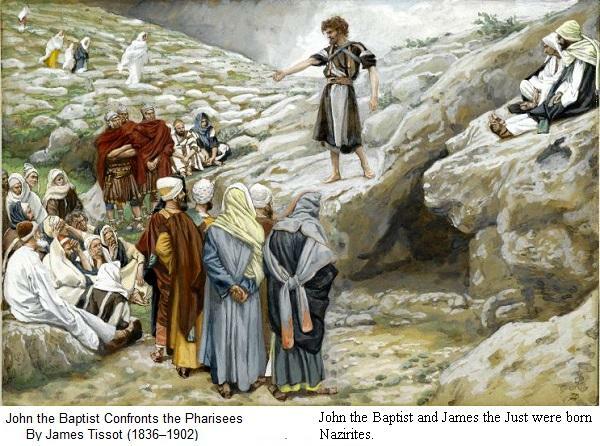 A group called Hassidim (piety/ pietist) led by Mattathias, a priest from Modi'in located northwest of Jerusalem, and five his sons, revolted against the rule of the Seleucid King of Syria and the rebel army led by Judas, one of his sons, finally entered Jerusalem in triumph on December 165 BC and ritually cleansed the Temple, reestablishing traditional Jewish worship there and installing. The Jewish festival of Hanukkah celebrates the re-dedication of the Temple following Judah Maccabee's victory over the Seleucids. However so called The Maccabean Revolt continued thereafter, after Judas' death in the battle, the younger brother Simon succeeded and finally established the Hasmonean dynasty. Herod, a non-Jew from Edom, who had been appointed the governor of Galilee by his father, a general of the Hasmonean dynasty, wrested the Imperial Throne riding on Roman intervention in the court struggle of Hasmonean. When Herod the Great was still governor of Galilee, a man called Hezekiah led a revolt. Although this rebellion was put down by Herod, Hezekiah was praised as the righteous by Sanhedrin and Herod was stymied. Herod the Great ruled Israel until 4 BC; at his death his kingdom was divided among his three sons. In Galilee, a man named Judas, son of Hezekiah, proclaimed himself as a descendant of the Hasmoneans and sparked the uprising at Sepphoris but was suppressed by Syrian Governor Publius Quinctilius Varus and Judas fled. When Judea became a direct jurisdiction of Rome after Herod Archelaos' misgovernment and downfall in the year 6 AD, Judas of Galilee once again uprose breaking into the royal armory at Sepphoris and seizing the arms in 7 AD. But he eventually was crushed and crucified with 2000 fellows. According to Flavius Josephus, author of "The Jewish War," at that time, a fiery figure known as Judas the Galilean urged his fellow countrymen to refuse to pay the Roman taxes and founded a secret society that took the name "Zealots." Judas is also said to have been a law scholar of Pharisees, Josephus identified Zealots, an offshoot of Hassidim, as the Fourth Philosophy of Judaism that was different from the Sadducees, the Pharisees, and the Essenes. A group which is said to have had close relationship with John the Baptist and was based at Qumran, near the shore of the Dead Sea, also seems to have been a religious and political association descended from Hassidim. James the Just is described as a born Nazirite in Church History written by the early church fathers, Eusebios (260-340) and Hegesippus (90-180). According to Epiphanius, a 4th-century Christian writer, James as the legitimate lineage of the High Priest representing both the Davidic royal family as well as a priestly Aaronic Lineage exercised the priesthood on behalf of his community, entering into the holy areas of the Temple where only priests could go and functioned as "high priest" to his followers. As mentioned above, if Jesus grew up with his brothers at Galilee, a bastion of Zealot, the teaching of Q source, which denies Creator God of the Old Testament and could lead people to ultimate salvation through awareness of the original Self, would not have been born. 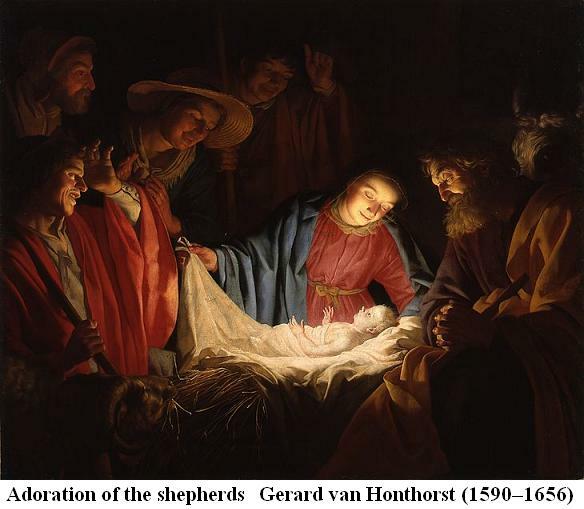 From this perspective, the description of the Gospel of Matthew, which says that Joseph and Mary brought a baby Jesus to Egypt, is suggestive. Thus Jesus was born in Bethlehem Ephrata. 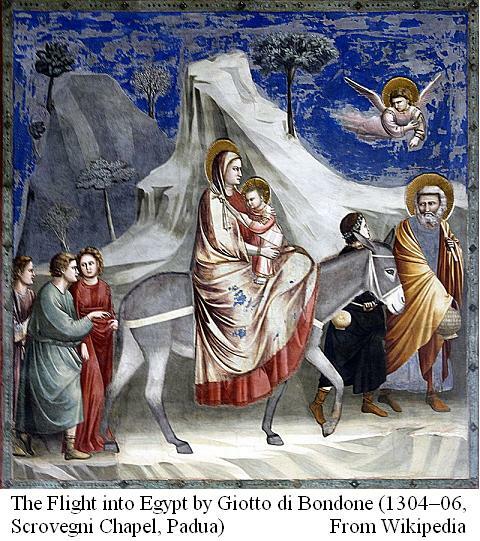 (Luke 2:6) However, Joseph who had finished registering the census, for some reason did not return to Galilee, but travelled with Mary and the newborn, Jesus, to Egypt. (Mat 2:14) The Gospel of Matthew refers to the following legend; King Herod, the ruler of Judea, who had heard of a prophecy that the Messiah was to be born, ordered to slaughter all male sons, under the age of two. (Mat 2:16) However, there is no record regarding Herod the Great's Massacre of the Innocents other than the Gospel of Matthew. The Gospel of Matthew added that this is the fulfillment of the prophecy of Jeremiah Chapter 31 verse 15 in the Old Testament. 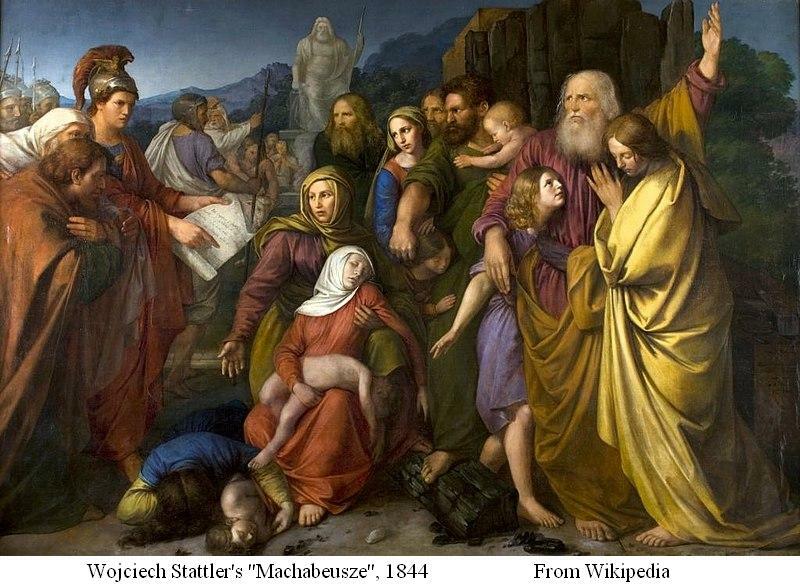 Apparently the incident of Herod the Great's Massacre of the Innocents seems to have been an episode created by Matthew who had tried to depict the life of Jesus as realization of the prophecies of the Old Testament. 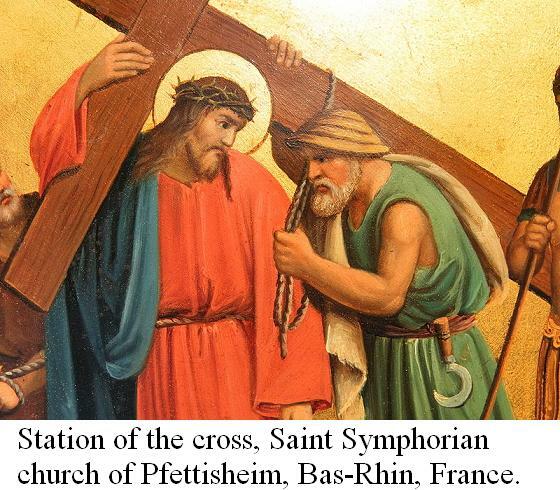 As Roman soldiers led Jesus to the place called Golgotha to crucify him, they forced a man called Simon from Cyrene passing by to carry the cross. It is a story that appears in all three Gospels of Matthew, Mark and Luke. Especially the Gospel of Mark notes that Simon was the father of Alexander and Rufus. This note implies that Alexander and Rufus were prominent leaders of Christ church at the time. Although the three gospels describe Simon as a country man, Cyrene was a big city facing the Mediterranean Sea, comparable to Alexandria in those days. It is also difficult to believe that Roman soldiers forced a stranger just passing by to carry the cross instead of Jesus being executed for treason. Therefore Simon might have been appointed to carry the cross from the beginning. Otherwise, the writers of the Gospels had no way to get the informations such as his name and his place of origin. Rufus seems to have become a disciple of Jesus in latter's lifetime because Paul describes him as a disciple whom the Lord picked out to be his very own. And if Rufus mentioned by Paul in his letter is same person of the son of Simon, Jesus might appointed by himself Simon to be a man to carry his cross and follow him. Furthermore, it seems quite be unusual that Paul describes Rufus' mother "She has been a mother to me." It is impossible that Paul was a uterine brother of Rufus. Then it might mean that she was a spiritual mother who converted Paul to Christianity. From the above description of the Gospel of John, we can see that the act of Jesus, that is, 'driving away merchants from the temple,' was clearly planned with the ancestor of Hanukkah, which their ancestors had recaptured the temple of Jerusalem from the Greeks and purified it and re-dedicated in the Maccabean Revolt, in mind and reflected the thought and beliefs of the group of former disciples of John the Baptist such as Peter, Andrew, James the Greater and his brother John and the leader of Nazirites James the Less and his younger brothers. But, it is far from the teaching of Jesus in Q Sayings Gospel, which denies Creator God of the Old Testament and could lead people to ultimate salvation through awareness of the original Self. However, Jesus seems to have had decided to act as a symbol of the movement of restoration of Israel when he made a debut to the religious society of Jerusalem with testimony of John the Baptist in Bethany. And the description of the Gospel of John implies that this plan was approved by Sanghrin chaired by the High Priest. By the way, if Jesus was 10 years old at the time of the revolt by Judas and his sons, James and Simon, and Mary, mother of Jesus, used three of these very names - James, Simon and Judas - for her own sons, there should have had an age difference of at least 10 years between Jesus and his younger brother James the Less. And the list of the twelve apostles contains the name of the son of James the Less. If this son, Judas, was 20 years old at the time of the Crucifixion, James the Less seems to have been over forty years old. Then, Jesus, who is older at least 10 years than James, should have been over 50 years old. How then can a man possess eternal life? 【Synthesis】"If you want to be baptized with the Holy Spirit, you can just go back to the word which was with God in the beginning (John 1:1) and certify that God is truthful. (John 3:33)"
When he said, "You are Huichao," Zen Master Fayan thrusted vivid Self in Huichao in front of his eyes. AD-SEAnews, New concept of SEAnews, aims to realize borderless one world.